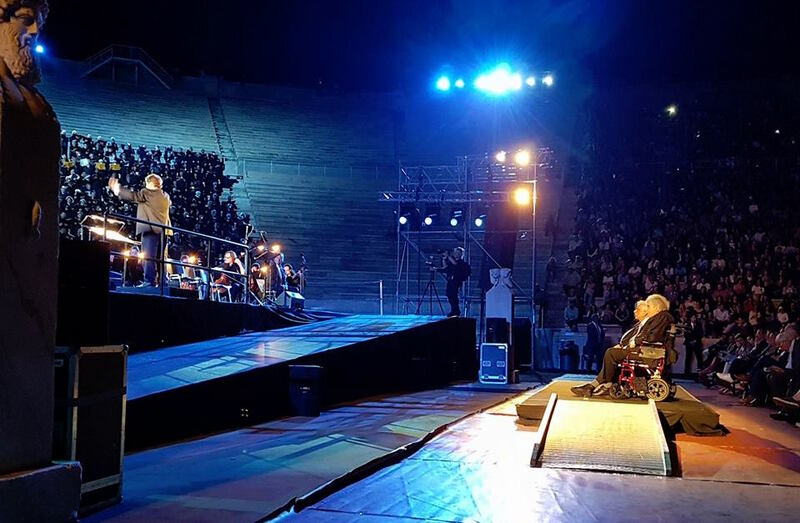 An one-thousand-member choir directed by Panagis Barbatis and 50.000 spectators paid tribute to Greek legendary composer Mikis Theodorakis in Athens on Monday, June 19. It was already a magical summer night at the Panathinaic stadium before the largest ever assembled choir in Greece took the stage to make history in front of people of all ages and social status who came together to honor Mikis Theodorakis. The concert was many times interrupted by sudden cheers of love towards Thedorakis. Greek President Prokopis Pavlopoulos who was sitting next him would often whisper to the composer what people said. Mikis would then smile and the crowd would applaud again! The composer of Zorba took to the stage towards the end of the concert bringing the crowd to tears. As the crowd wouldn’t stop applauding he also broke to tears! The historical concert that also featured the Athenian Mandolinata Orchestra included excerpts from the most important poetic works of the composer; some of which included: “Μικρές Κυκλάδες” (Small Cyclades), “Άξιον Εστί” (Axion Esti), Επιφάνια” (Epiphany), “Όμορφη Πόλη” (Beautiful City), “Archipelagos,” “Πολιτεία” (Politeia), “Λιποτάκτες” (Lipokataktes), “Χαιρετισμοί (Greetings) and “Neighborhood of the Angels,” all pieces were performed with the choral adaptation of Panagi Barbati. The actors taking part included Yannis Stankoglu, Ioanna Pappa; the lyric artists Gina Fotinopoulou, Eleni Voudouraki, Antonis Koronaios, Babis Velissarios, Pantelis Kontos and popular singer Gerasimos Andreatos.